Loads of colour, including pink; sweary typography; stuff that makes the house feel like a circus/zoo/nightclub/spa; old things that have a story; child-unfriendly velvet furniture; London-related stuff; gold things; neon; blackboards; anything by Soho House or Kit Kemp. My ‘Ain’t Nobody Got Time For That’ cross-stitch cushion from US brand Furbish. It’s cheeky and luxe, which kind of sums up my style. Plus, the Pink House Husband hates it. So tough to choose, but Amanyara in the Turks & Caicos is hard to beat - read about my stay here. Perhaps it would be easier to ask what it doesn’t mean to me, as pink has permeated so many parts of my life. For me, it’s more than just a colour, it’s a state of mind. I guess that’s why I’ve written a book, Pink House Living, all about it. Are you cheating on fashion with furniture? Yes. I’m a brazen hussy when it comes to my home. Jenny has loved the combination of writing and interiors ever since she scribbled 'dinosaw' on her childhood wall (“sorry Mum”). She has written articles for Elle and Oh Comely, created social for The Great British Bake Off and was shortlisted for Penguin's Write Now award for her debut novel. Send interiors tips and dinosaur GIFs to jenny@pinkhouse.co.uk. Playful and decorative. I like bold patterns and a mish-mash of colours, but with an innate calmness to soothe my eyes (and soul). I'm just starting my art collection, so a wall full of independent artists is the dream. I'm going to sneak three in: a vintage rattan sun mirror from France, my marbled bedroom lamps from Pooky lights and my Farrow and Ball Aranami wallpaper even though putting it up has caused mild PTSD. La Grenouillère and Durslade Farmhouse are on the list. Monaci delle Terre Nere and Coombeshead Farm have been my favourites so far. Fun, springtime and never taking things too seriously. Absolutely – my monthly spending budget and eBay alerts are shifting from Rixo to Rococo. 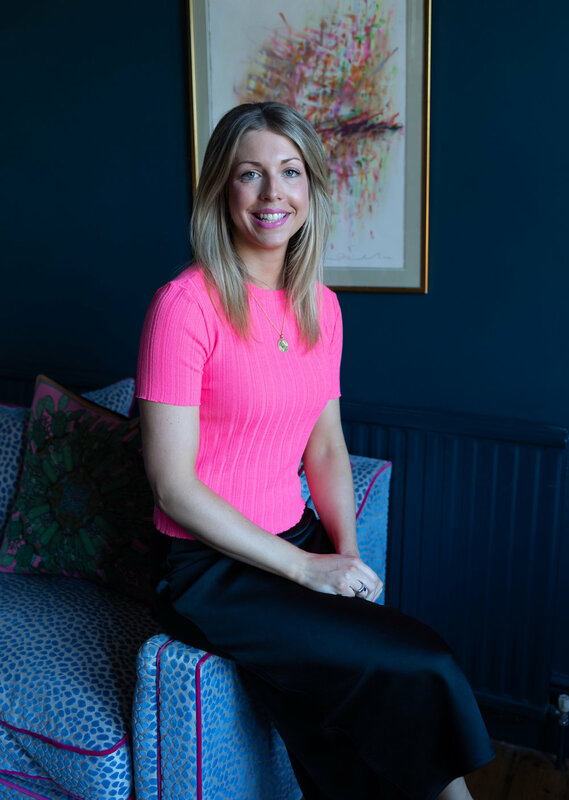 Since becoming a homeowner, fashion journalist Jayne has discovered interior design is now top of her agenda. Contact Jayne with feature suggestions, homeware must-haves, and tips on getting water marks out of velvet (see below) on jayne@pinkhouse.co.uk. Minimalistic with a punch of colour. I have a current penchant for dark grey and mustard colour combos, and live for the day I have ceilings high enough to paint a room Farrow & Ball Hague Blue. I need big windows, lots of light, and vases filled with mimosa to make me truly happy at home. Growing up in Perthshire means Gleneagles is high on the list for ultimate luxury and breathtaking views. But back in the city, The Curtain in Shoreditch has thought of everything - did you know they have a sundowners bar trolley that comes to your room? I’m known for always wearing a bold lip colour, and fuchsia pink has long been my go-to when I want to complete my look and feel polished. On the daily! The thing is, with fashion, once you’ve bought the look, you’re done. But with furniture, a room is never finished. Hotel-hound Rachel is all about interiors that make you feel like royalty, but in a relaxed kind of way. If you have a fabulous hotel, bar or restaurant you think The Pink House should review, contact Rachel on rachel@pinkhouse.co.uk. Plant-obsessed, antiques-keen and lover of deep, bold velvets. My bureau desk for sure, with its coat of grey Annie Sloan chalk paint. It's got these amazing fruit and flower etchings on the drawers and its original brass handles. Spain's Torralbenc in a heartbeat. It's miles away from my interior style, with unassuming natural textures and neutral tones everywhere. But the finishes are seamless and there's a huge flower field that spans for miles outside that reminds me of the poppy field in the Wizard of Oz. I became obsessed with the colour pink after watching the Mean Girls film (I am not ashamed to admit it anymore) - long live Pink Wednesdays! Now I'm no longer 12, wearing and decorating in pink is a huge F you to everyone who associates it with 'ditzy, stupid girls' - it's a reclaiming of femininity.